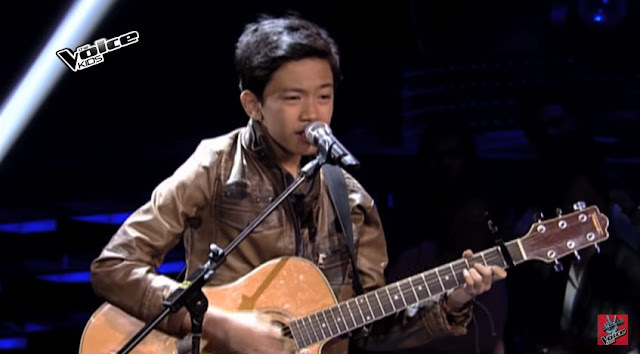 MANILA, Philippines - Thirteen year-old kid from Cagayan de Oro City wowed the three coaches as they turned their red chairs in the Blind Auditions of ABS-CBN's popular vocal competition "The Voice Kids" Philippines Season 2 on Saturday, July 4, 2015. Andoy who admitted a certified of Coach Bamboo fan sang Ed Sheeran's hit "Give Me Love." "Minsan pag kumakanta ako, para akong possessed eh. Music takes over my soul." Coach Bambooshared to Andoy. However, Andoy picked Team Sarah saying he has crush on the Popstar Princess. "Dahil ako po'y payat at parang tinidor. Ang pipiliin ko pong coach ay si... CoachSarah!" As of now, Team Sarah is leading with 13 artists: Gift Cerna, Andoy Patuasic, Iya Dator, Alyssa Celo, Francis Ryan Lim, Gian Tambis Ale, Ken Membrano, Krystle Campos, Kyle Echarri, Zephanie Dimaranan, Kenshley Abad, Mikhaela Sevillana and Jolianne. Making up Kamp Kawayan, meanwhile, are Romeo Espino, Atascha Mercado, Altair Aguelo, Christian Pasno, Lance Kharl Macalinao, Martina Ortiz Luis, Benedict Inciong, Nicole Apolinar, Ashley Simone Teves and Emman & Sandy Tanyo. Coach Lea already recruited nine artists for her team: Angel Enerio, Kiyana Bongat, Bianca Marbella, Reynan Dal-Anay, Stephanie Jordan, Noah Anthony Anderson, Esang de Torres, Joemar "Dodong" Lazarraga and Luke James Alford.